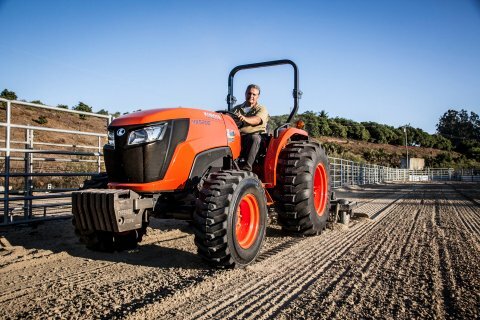 Kubota Tractor Corporation announced today the availability of its first phase of all-new Kubota Hay Tools and Spreaders in U.S. Kubota dealerships. The new machinery further expands Kubota’s strength in the agricultural market, allowing its dealers to serve as a convenient, one-stop destination for Kubota tractors, hay implements and spreaders. As announced in late 2013, the new implements will be produced by Kverneland Group, a leading international company that develops, produces and distributes agriculture machinery. 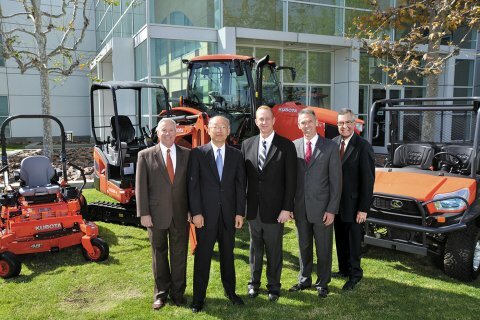 Kubota Corporation completed a full-ownership acquisition of Kverneland Group in May 2012. The first phase of implements includes five disc mowers, ranging from 5’6” to 10’6”; a rotary rake and tedder, with a working width of 13’9” and 17’1” respectively; and pendulum spreaders, with capacities ranging from 7.8 to 47.7 cubic ft.
Kubota offers the DM1000 and DM2000-Series side-mounted disc mowers with a working width ranging from 5’6” up to 10’6”. With three counter-rotating blades per disc, Kubota mowers cut constantly, which means one-third less load per blade. Additionally, with smoother power usage, Kubota mowers produce neat, cleanly cut stubble. A fully-welded cutterbar with overlapping C-channels sets Kubota disc mowers apart. The strong and rigid design ensures a high level of durability, while the cutterbar’s high oil capacity produces a low working temperature for efficient cooling and lubrication of the entire cutterbar. 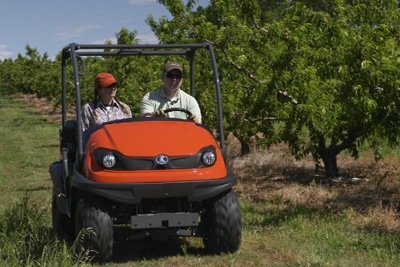 The Kubota cutterbar is designed for low maintenance and offers quiet operation. The long curved gear wheels run smoothly in oil and provide a solid transfer of power with little slack. When an obstacle is encountered, the mower swings backwards to protect the cutterbar. Kubota’s DM2000 Series models are fitted with an integrated Break Away system that provides maximum cutterbar protection without the need to stop or reverse the tractor. When an obstacle is struck, the Break Away system will be activated, swinging the attachment backward and over the obstacle, then returning to the original working position automatically. When in transport, the mowers are folded to a vertical position well behind the tractor. The center of gravity is close to the tractor, ensuring excellent weight distribution and transport stability. The mower is easily lifted via a hydraulic cylinder without activating the tractor’s three point linkage. The advantage is less wear on the tractor and machine, as the PTO stays in the same position, minimizing vibrations in the transmission. The new Kubota TE4052T rotary tedder is designed to optimize performance for producing dry hay. The four rotors, in combination with a wide overlap, ensure complete pick up of the hay and equal distribution over the entire 17’1” working width. The Kubota TE4052T rotors are driven by a low-maintenance gearbox with only one grease point. The gearbox is mounted directly to the frame to provide full support across the tedder. The pull-type design with a low weight of 904 lbs. is ideal for applications with low horsepower tractors or on hilly terrain. Kubota’s Super-C tines are made of 9mm spring steel for added strength and extended service life, even when tedding large quantities. The tines are equal length, so there is no need to store two types of tines, and triangular washers allow the tine angle to be set quickly and easily in three different positions. The Kubota TE4052T is built around a rugged new box section chassis, made out of one piece of metal with only one welding seam for maximum rigidity. The chassis design is fully enclosed at the top edge for maximum strength. Its solid design allows the tedder to accommodate hefty loads and during transport, the hydraulic folding action automatically raises the tines. Ideal for low horsepower tractors, Kubota’s first pull-type rotary rake, the RA1042T, has a working width of 13’9” and is fitted with 11 tangential tine arms and four double tines per arm. The high tine frequency ensures clean raking performance, even at a reduced rpm and high travel speed. The Kubota RA1042T single rotary rake features oil-immersed cam discs and guide rollers. The arm bearings are integrated into and permanently greased inside the Kubota-developed cam track for low maintenance. The cam tracks are specifically tailored to individual rotor diameters for optimum raking at any working width and on any model. Fitted with high-lift curved tine arms, the single rotary rake ensures a regular and even windrow formation. The curved shape prevents material from being pushed in the direction of the rotor and allows for higher lifting out of the swath. With 19.7” lifting height on the HydroLift, windrows are easily cleared when driven over. The rotor is lifted using only a single acting valve. A 4-wheel 18.5” tandem axle is standard and offers excellent ground contour to minimize the amount of dirt into the windrow. The Kubota RA1042T single rotary rake is conveniently set for transport and can be raised from the tractor driver’s seat. Additionally, the guard is folded manually and tine arms are quickly removed for an even more narrow transport width. The Kubota VS-Series spreaders, VS220, VS400, VS400VITI, and VS600 are easy to operate and provide outstanding accuracy in all conditions. With a spreading width range from 3’ to 49’, the SuperFlow spreading system and pendulum movement of the spout ensures the application rate is identical on both sides, giving the operator maximum accuracy for any application. This results in a symmetric spreading pattern and excellent overlap. Kubota’s VS-Series spreaders are built for a long service life with an optimized frame shape, a fiberglass reinforced polyester hopper, stainless steel metering discs, and unique Duracoat corrosion resistant paint. The versatile spreaders are popular for golf courses, vineyards, and general farming applications. All Kubota VS-Series spreaders can be controlled manually, hydraulically or electronically. The plastic scale on the spreading unit allows continuous adjustment of the application rate in pounds per acre, so the risk of spreading errors is minimal. Using the spreading table and the dial, the operator can determine the desired quantity of fertilizer for every spreading width and forward speed. For more product information, please visit the Hay Tools and Spreaders product pages on www.kubota.com.